Charles B. French Official Site: How I Met Your Mother: "The Magician's Code"
How I Met Your Mother: "The Magician's Code"
Quick Review: So that's where they're going with this. Spoilers ahead, so watch the episode before you proceed. Especially this one, because you know they like to do all these big reveals at the end of the season. Why do you think they stretch these things out so long? I mean, the entire show is built around the final reveal when Ted meets "The Mother," and if you've been watching for a long time, you don't want to go and get spoiled right when they finally get to the good stuff. And even if that's not the big reveal, you know we're going to find out who Barney is marrying. They've been teasing us for a whole year about that, so don't you think you should just watch the episode first? That's what I thought. I can't believe we even have to have this conversation. 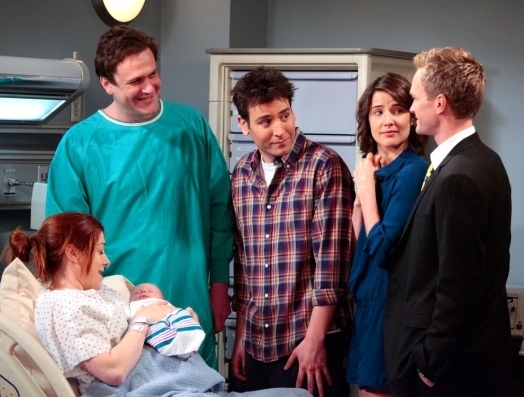 Best Episode Moment: Barney tells the bus driver why he needs to let Marshall be there for the birth of his child. Worst Episode Moment: Ted drives off into the sunset with Victoria. Best Reveal: We find out what's really behind the door at MacLarins. Worst Reveal: That's not Neil Young. Reveal the Jury's Still Out On: Robin is Barney's bride. Worst Character Interaction: Lily's dad is still the last person you call when you're facing major surgery. Worst Announcement: Ted telling the world about Lily's cervix. Most Stunning Realization: "That guy's a dad." Biggest Understatement: "I might have a thing later." Biggest Question: How DID Barney get that sword past security? Best Callback: Glad to see the Fiero back in action with its rocking Proclaimers soundtrack. Any hint about The Mother? Unless Ted really gets his life together, I'm starting to lose respect for this woman. Any hint about The Wedding? We now know who Barney is marrying, but that raises other questions. Why Robin? Why not Quinn? When is this wedding, since the timeline for Ted to meet his wife there, get married, get her pregnant, and have a daughter is a little less than three years. Do we like Ted this episode? Oh, no we do not. For a moment, it looked like Ted was finally becoming the man he needed to be. Then he pulls that stunt with Victoria, and our only hope is that five seconds later they both realize that this is not the healthiest thing to do with their lives. Overall Opinion of the Episode: I'm not going to really talk much about these two episodes. Instead, what I want to talk about is the ending, particularly when Ted and Marshall acted as proxies for the writers. Ted: "The road to this day has had a few twists and turns, hasn't it?" Marshall: "In a way, it all makes sense, doesn't it?" There's a habit in speech called Tag Questions. When you're not that confident in your position, you'll throw out a question at the end of each sentence, in a way begging your audience to agree with you. Rather than win them over with the power of your words or the strength of your conviction, you are just asking them to take your side. Right? It's bad enough when people do it in a conversation, but to have a television character do it just makes me sad. Those two lines are some of the most painfully ham-fisted lines in the entire show's run. The writers are doing their best to convince us to stick around because they swear all the twists and turns make sense, and it'll be good, we promise. Now, when a show does this ironically, in a "we're breaking the fourth wall Zack Morris style," I can get behind that. But when these lines are spoken in earnest, it not only doesn't make me trust the direction of the series, it makes me a little afraid for where this is going. This show is built upon an ending. The first line told us where it all would end: Ted's going to met the mother of his children. From the very beginning, we all wondered how this show would be able to string us along, asking us to wait patiently for the big reveal. Most shows don't last that long, but this one did. And the reason for its longevity is simple: we love these characters. It didn't matter that it would be years before we'd see Ted meet the woman of his dreams. We loved watching Ted, Marshall, Lily, Barney, and Robin, live, love, and drink their way through New York. Yes, there was an end game in mind, but the journey was well worth taking. If the show was taking the scenic route, we knew that a slap bet, Robin Sparkles video, or one of Barney's many theories would keep us more than entertained. But here's the problem. In a show with a built-in ending, you're going to get to the point where the writers start marking time. What I mean is that it stops being about the journey and becomes setting everything up for the final episode. That's when you get episodes that can't really stand on their own because they're meant to just move the story along. In this episode, Barney proposes to Quinn. The problem is that his proposal takes far too long and would have been a lot more special had it been condensed into once scene. It should have happened in the security line with the discovery of the box. Instead, we have three long scenes when one would have sufficed. Because we waited too long to see what was obviously going to happen, it was less effective. Of course, the reason Barney proposed is to that we're far more shocked to see Robin as his bride. This season seems to have been all about misdirection, first pairing Barney with Nora and this Quinn all so we'd never suspect that Robin was the bride. (A notion Barney even alluded to this episode.) I have no issue with the pairing, and I am curious to see how it all unfolds. However, because the show spent so much time trying to misdirect, it wasted many opportunities to just explore these characters and let them grow naturally. What's worse, shoehorning them into a pre-set plot makes it easy for the writers to just give us convoluted reasons for them getting from point A to point B. I've seen this happen in other shows, Smallville being a recent example. Since Clark Kent must become Superman, the writers never spent serious time on how Clark makes that transition. He simply threw on the cape and tights, flew into the air, and everyone loved him. The writers just assumed the audience was so eager to see Clark become Superman that they wouldn't care that it made no sense the way he got there. I really don't want to see that happen with this series. I love this show, so much so that I'll watch reruns of episodes I have on DVD. I adore these characters and will be there until the very end. That's why I want to know that this series will give them stories worthy of them. I want to know that it's doing more than just stringing us along, assured that we're going to stick with it to the final episode no matter what. Let's not forget the most egregious offender: The Star Wars Prequels. From day one, we knew that little Anakin would become Darth Vader. But what should have been an epic story turned out to be the tale of an emo-Jedi and Jar-Jar Binks. That's why those two lines bothered me so much. I want to know that this show not only has a great ending, but a fantastic journey there as well. I don't want to just be told that it's a great story. I'll decide whether or not it's great, thank you very much. I don't need to characters to try to sell their own story. It's insulting. The writers now need to make sure it's great, and the best thing they can do is not pull a George Lucas. What I mean is that they are so assured of their own brilliance that they can't see how they are ruining what should be a masterpiece. They need a few critical voices who can help them do more than just mark time, but bring this show back to the brilliance of the first few seasons. The good news is that it's not too late. I still believe in this show, I believe that we can have an ending that is funny and moving, a love story that people will remember for all the right reasons. This show is at a crossroads, and I'm going to keep reviewing it until the end. We have many new questions, and how they answer them will determine whether this experiment in telling a love story in reverse is going to pay off.